Marvin Greenwald, 93, of Loveland went to his heavenly home to be with his Savior on Tuesday, January 29, 2019. Marvin was born on December 1, 1925 to David and Alvina Greenwald in Battle Creek, Iowa. Marvin was raised on the family farm in Battle Creek Iowa and graduated from Cushing, Iowa High School. He married Bonnie West on July 27, 1949 in Ida Grove, Iowa and they enjoyed over 59 years together. They moved to Loveland, CO in May 1965. Marvin was a member of Immanuel Lutheran Church and loved spending time with his family and friends. 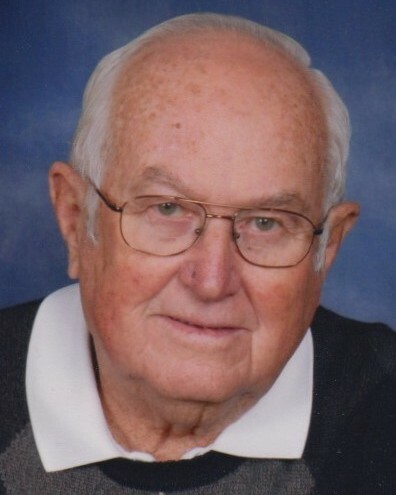 He always enjoyed bowling, golfing, fishing, hunting, square dancing, traveling and all his crafts while he was able and continued enjoyed playing cards until he passed. Marvin is survived by his three daughters; Denise Dean (Daniel), Diane Sowder, Gloria Preuss (Gunter) all of Loveland; his sister Bernice Alioth of Holstein, Iowa and his special friends John Henderson and Mary Critchlow and family of Loveland. He had 7 grandchildren and 14 great-grandchildren and 1 great-great grandchild as well as numerous in-laws, nieces and nephews. He was preceded in death by his wife Bonnie in 2008, son Gary in 1978, son-in-law Dan in 1991 and brother Walter in 2005. Memorial service will be held Thursday, February 7, 2019 at 1:00 pm at Viegut Funeral Home, 1616 N. Lincoln Av, Loveland CO. Memorial contributions may be made to Immanuel Lutheran Church and School Building Fund in care of Immanuel Lutheran Church, 4650 Sunview Drive, Loveland, CO 80538.